Dave Warshaw has been creating distinctive tattoo art for two decades, thirteen of those and counting at one of the best known tattoo shops in Southern California, Avalon Tattoo II. Recently, one Dave’s appointments canceled at the last minute. Dave’s pal, Ryan Sinn, formerly of The Distillers and Angels and Airwaves was at the parlor and decided to take the time slot. Dave tattooed his “Four Eyes” creation (currently on display at La Luz de Jesus Gallery) on Ryan – in one shot – a total of four hours! Tattoo art genius! Dave also creates fantastical imagery on wooden surfaces. From the poetic and surreal intertwining of live thorny vines to nectar-oozing flowers surrounding his detailed creations which he calls “Urbantaxidermy,” the artist’s compositions flow like a virtuoso playing his chosen instrument. Warshaw’s mediums are ballpoint pen and wood – all types of wood, from balsa to skate deck. At one time Warshaw carved wood and painted with watercolors and acrylic, but now strictly creates his art with ballpoint. “My first creations were based on original commercial clay and steel wheel skateboard graphics from the 1960s. I then began morphing the company logos into my own surreal creatures. I use cheap ballpoint pens, the kind you find at the drugstore. If the wood surface is too grainy and unfriendly to the ballpoint, I will use a fine tip ink pen for my line-work – and then go back over and finish with ballpoint pen,” explains Warshaw whose art is heavily inspired by Southern California car-surf-skate-comic-Tiki and punk rock culture. 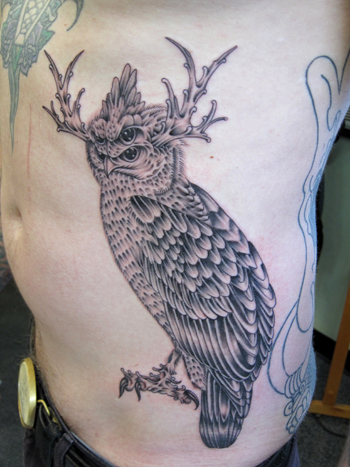 It was Warshaw’s creative efforts that lead him to a career in tattoo art. 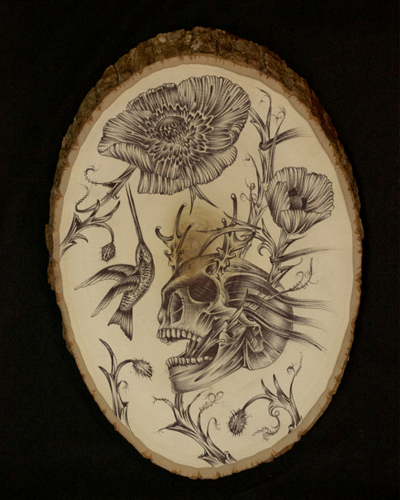 Warshaw starts his pieces much like his tattoo art, using a sketch which he transfers to wood, then lines and shades using his improvisation and imagination as his guide. “I don’t scribble on the surface– you have to be cautious as the ink from the pen smears easily and you cannot erase wood,” says Warshaw who, as a tattooist, knows well that you only get one shot and cannot blow it! Among the many wooden “canvases” Warshaw uses for his art are one-of-a-kind skate decks specifically made for him by the oldest manufacturer of skateboards, Watson Laminates, the company that was responsible for the original Dogtown decks, among other classics. Along tattoo art and his ballpoint pen, Warshaw plays guitar in The Creepy Creeps, a San Diego surf-garage-punk rock band with releases on Dionysus Records. In 2011, the group were hand-chosen by Robert Plant to open for his Band of Joy shows in Southern California. Warshaw works and plays in San Diego, CA. where he enjoys a family life with his wife and son.